Many women are opting for dainty wedding bands, whether it is a plain wedding band or a diamond wedding band. This makes it easy for rings to be stacked next to each other as well as mixed and matched to create a unique look. I wanted to share a variety of dainty wedding bands that are currently available from deBebians. These rings will be beautiful when paired with an engagement ring, worn alone, or next to additional rings. Who doesn’t love a little pop of rose gold? This 2mm ring is available in other precious metals, but I love the idea of adding a little bit of rose gold into your bridal set. 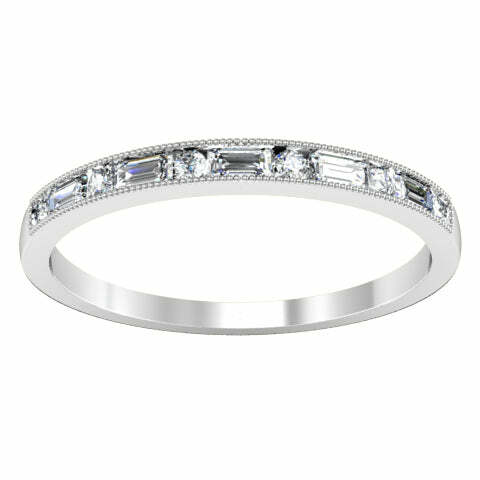 It would be a lovely wedding band or it can be worn as a spacer ring between your engagement ring and a diamond band. 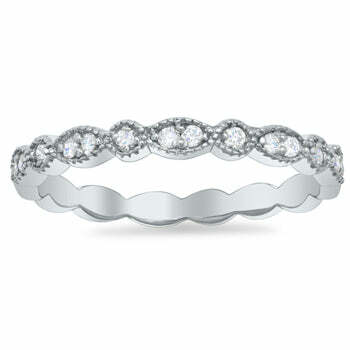 It is easy to see why this is one of our most popular wedding bands for women. The scalloped design makes it a flattering and classic option that can be paired with different styles of engagement rings and wedding bands. This ring comes in your choice of 14 karat gold. It has a 2.5mm width. This milgrained wedding band features alternating baguette and round brilliant cut diamonds. 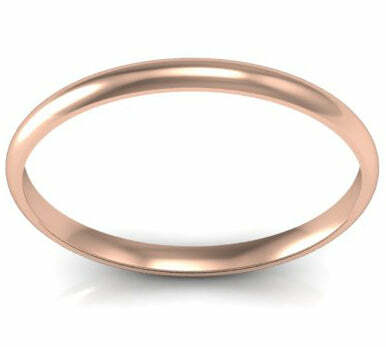 The milgrain detailing is added by hand at the end of the manufacturing process and gives the ring an antique look. This ring would be a beautiful addition to any bridal set. Dainty wedding bands are beautiful, but they may take a little extra care. If you choose a dainty diamond wedding band, be mindful while you wear it and have it inspected regularly to ensure that the diamonds are tight. With any piece of fine jewelry, you want to wear it with care not when you’re doing heavy lifting or when you’re swimming.